1 Cut the steak into strips of 2-3cm and mix it with the corn flour. 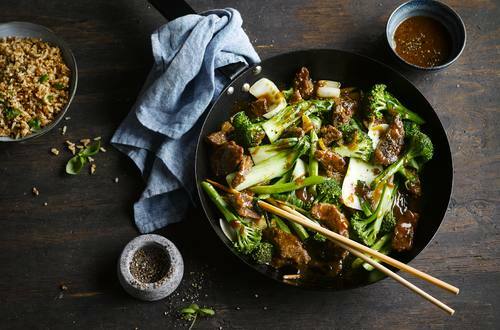 2 Heat a tablespoon of oil in a wok and fry the beef quickly over a high heat until it gets some colour. Set aside. 3 Turn down the heat a little and add the garlic and ginger, fry for another 10 seconds. 4 Add all of the vegetables and fry for another 3 minutes, they still need to be crispy. 5 Turn down the heat and mix it with the Hoisin sauce,100ml water and Knorr Beef Stock. 6 Bring to a boil and add the beef and heat through.